I have a severe allergy to peanuts which means that I avoid all nuts in any shape or form. I thought I would tell you my experience of eating in Disneyland Paris as someone who has a nut allergy. For me, it is extremely dangerous if I eat even a trace of peanuts so it is highly important that I eat in places where I feel safe and comfortable. I have been to Disneyland Paris before but the last time I visited was 6 years ago. I knew I had an allergy on previous trips but I had always been with my family. Last week I went to Disneyland Paris with my friend and it was my first trip abroad without my family there. Before going I felt extremely nervous about my food. I wasn’t sure where I would be able to eat and whether I would feel comfortable eating in places if they couldn’t guarantee that there wasn’t a trace of nuts. I was worried about losing my epipens or even worse having to use them. I was worried about losing my Piriton as if I have a minor reaction I know I can use Piriton before my epipens. So basically I was worried about all aspects of my allergy when it came to going to Disneyland Paris! I first dealt with my worry of losing my medication. I took 4 epipens. I took 2 out during the day with me and left 2 in the hotel safe. That way I knew if I lost my bag I still had some epipens stored safely. I did the same with my inhalers, took one to the park and left one in the hotel. The two epipens and inhaler that I carried to the park I kept together in a bright red pouch that I bought in Uniqlo. I could easily see the pouch in my bag which made it easy to know it was there and it was big enough that I would notice if I dropped it out of my bag. 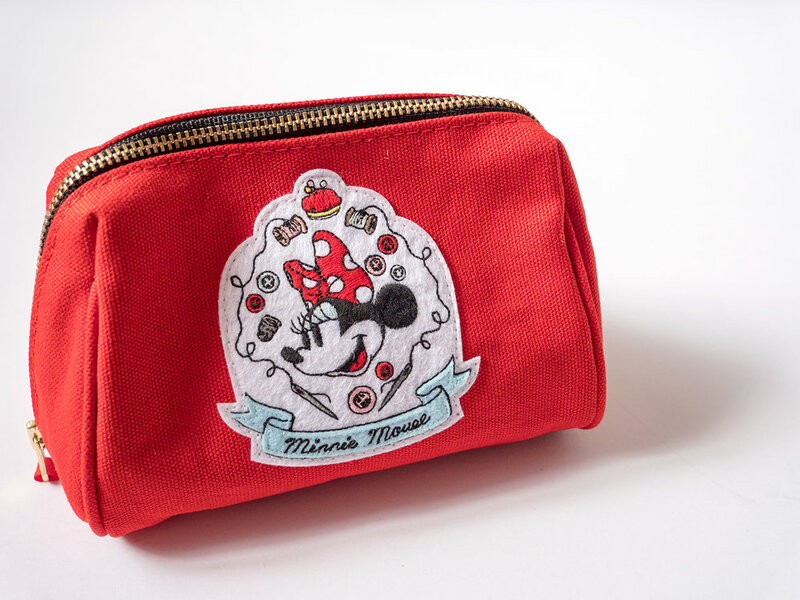 I actually have one of the pouches as part of a giveaway on my Instagram which is open until May 29th. Now closed. My tablets I kept in a clear case from Superdry. I have this ‘jelly purse’ and it was honestly one of the best purchases I have ever made. I found this really handy to quickly check I had my Piriton before leaving the hotel or before eating. I also used it to store Nurofen, paracetamol etc. I attached a keyring to the clear case and attached it to the zip of my backpacks inside pocket. That way I knew it wouldn’t fall out my bag and gave me quick easy access. I didn’t have to worry about losing anything as I knew I had spares safely stored and I had secured my medication as best I could in my bag. As I don’t speak French I also took allergy cards with me. I actually asked my old French teacher to translate a few sentences for me into French. You can buy cards online or make your own. I used it a few times and I am glad I had it with me. I had the following written on my card in both French and English. I have a life-threatening allergy to nuts, nut oils, peanuts and peanut oil. Does this food contain nuts, nut oils, peanuts or peanut oil? I also placed a card in the pouch with my epipens stating that it was medical equipment and if found to call my mobile number or return it to the hotel I was staying at. The first place I ate was McDonalds in the Disney Village. McDonalds has always been somewhere I can rely on as a nut allergy sufferer wherever in the world I am. I found the McDonalds in the Disney Village quite difficult. The staff didn’t speak very good English which made me nervous. I ate some fries there and I also had a drink. I preferred eating in the parks to McDonalds because it was so busy and chaotic and they didn’t make me feel entirely confident about the food I was eating. This is obviously only my personal experience but I would definitely rather eat in the park than McDonalds. I found eating in the parks generally easy. I felt a lot more at ease after I ate in the parks for the first time and had a good experience. The staff all spoke good enough English that they understood what I was asking when talking about my allergy. They presented me with an allergen menu and explained to me whether the food I wanted to eat was suitable. A lot of the time the staff already knew that the food I was asking about was safe but they showed me the allergen menu anyway. I felt extremely confident and comfortable eating in the restaurants. 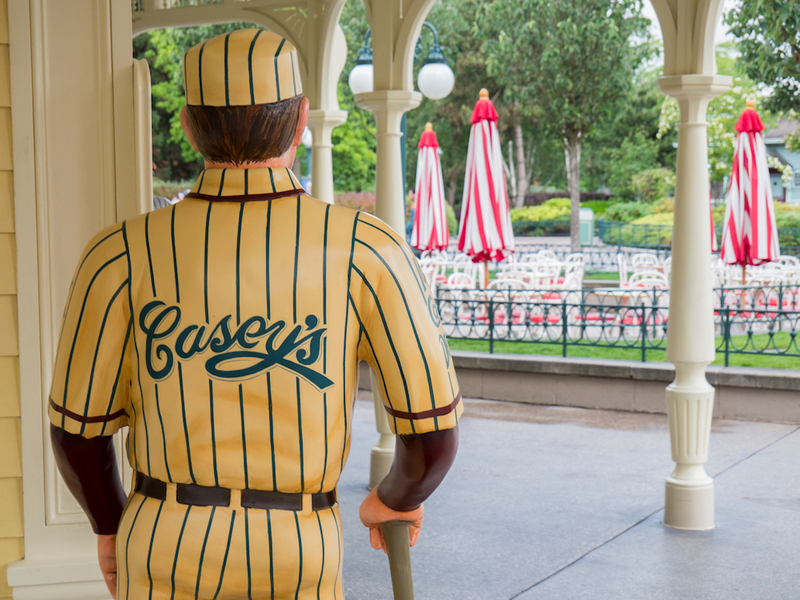 I am a particular fan of Caseys, you must try a hot-dog there! I definitely wouldn’t worry about eating with a nut allergy next time I visit Disneyland Paris. 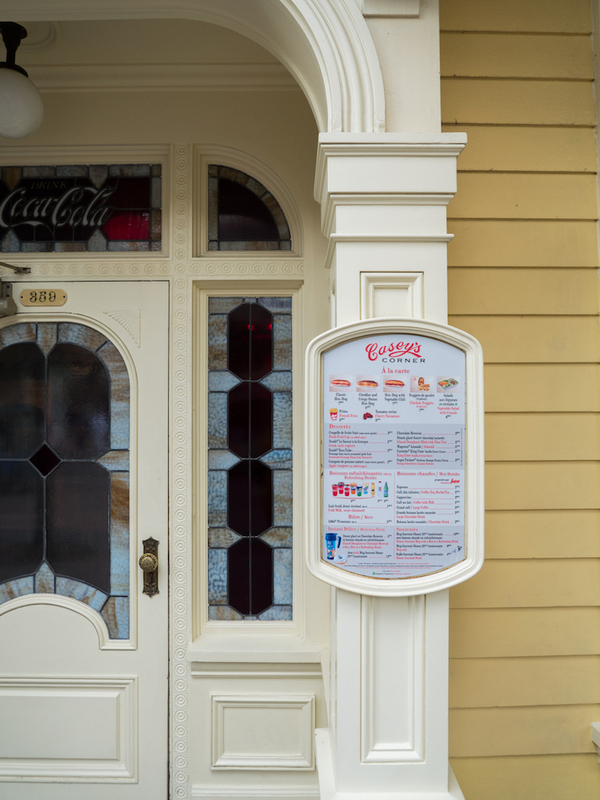 Although I had a good experience whilst at Disneyland Paris when it came to eating with an allergy, I did have two very minor issues food-wise whilst there. The first was at Plaza Gardens Character Breakfast. I asked when I first went in about my allergy and I was then passed from cast member to cast member. It took speaking to multiple members of staff before anyone would speak to me about my allergy. If I am honest this spoiled my experience at the breakfast. I felt quite nervous whilst waiting to find out what I could eat as I was passed from person to person. I wasn’t sure whether I would end up being able to eat anything and being passed around definitely made me feel unsettled. The chef eventually came and spoke to me and showed me the allergen menu. There did seem to be quite a bit of the food I couldn’t eat but the hot food (sausages, bacon, pancakes etc.) where okay to eat. I had a small plate of food but I didn’t have an appetite from my experience I had upon entering the restaurant. This is only my personal experience and it could be different for others. Personally I wouldn’t return purely because of the food. As a general experience I would recommend Plaza Gardens Character Breakfast. 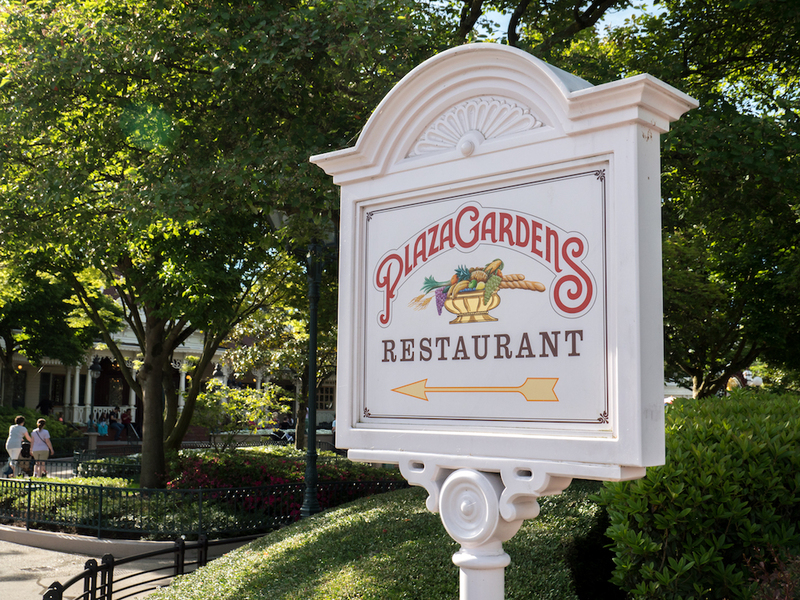 I had heard that Plaza Gardens since becoming a character dining was quite rushed and disorganised. We had booked the 9:45am sitting so we could use Extra Magic Hours before heading to breakfast. The 9:45am time worked out perfectly for us. We entered the restaurant on time and we were finished by about 11am. During the breakfast we didn’t feel rushed at all. We had plenty of time before the characters arrived to get food and then we got to meet Piglet, Tigger and Eeyore. There was enough time between and after the Winnie the Pooh characters to get more food before getting to meet Mickey, Scrooge and Daisy Duck. You don’t have a lot of time for a character interaction as they go from table to table quite quickly but this is common in most character dining experiences. We did have enough time for both of us to have a photo and an autograph from each character. I’ve included the photos I have from the character breakfast below. If I didn’t have an allergy then I would definitely recommend Plaza Gardens, but the experience I had wasn’t the most comfortable and therefore I personally wouldn’t return should I visit Disneyland Paris again in the future, which of course I will be. Everyone has a different experience so I am sure there are plenty of people with allergies who have enjoyed Plaza Gardens, this was just my personal experience. I hope that if you are visiting Disneyland Paris soon with a nut allergy that this post has helped in some way. If you have any more questions be sure to let me know and I will try my best to help you. I was personally very worried about eating in Disneyland Paris before I went. I was made to feel incredibly confident and comfortable when eating in the parks. I was always shown an allergy menu if I wanted to see it. I will return knowing that I can eat in the parks with my nut allergy and not have to worry.